All the recent talk of the hurricane hitting the East coast and the preparations families made to weather it out and/or evacuate was a good reminder for me to take a look at our family's emergency supplies and make sure things are updated. Our first priority for emergency preparedness has always been our 72-hour kits (also often called "Go Bags"). I assembled my first when I was living on my own and have added more for my husband and kids as they've come along. The goal of a 72-hour kit is to supply each member of the family with enough food, clothing, toiletries, and emergency supplies to get through 3 days. It should be easy for each family member to grab quickly and carry independently. We store each person's individual supplies in a backpack or diaper bag and have one duffel for shared family supplies. Containers with back or shoulder straps are ideal, because they lighten the somewhat heavy loads. I've marked the bags with each person's name both to help us know instantly whose is whose and to help emergency personnel identify us if necessary. Old diaper bag. I like keeping all our bags the same color so we can find each other in a crowd if need be. We purchased a pre-assembled first aid kit to ensure we didn't forget anything important, and because it was so compact. Check out all the stuff this one little kit stores! We rotate our kits twice a year to keep food fresh and clothes in current sizes. Food should ideally have an expiration date at least 1 year from the date you're storing it, to give you time to use it in your pantry after replacing it in the kit. Avoid pop-top lids, as they've been known to explode and make a mess in storage. Pack foods that are not only nutritious, but that your family enjoys eating. Comfort foods are great in a stressful situation. Hard candy and gum are good for keeping spirits up and mouths busy. Avoid foods that require water to prepare. 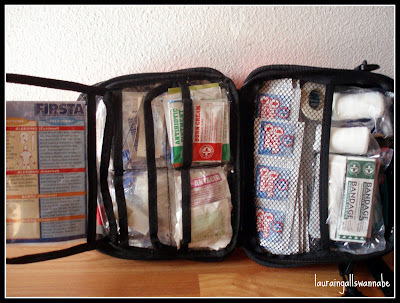 Pack wet cosmetics/toiletries in zip-top bags in case of leaks. 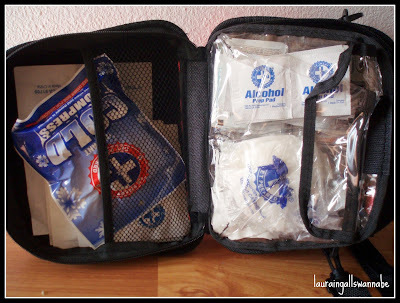 Pack tissues, toilet paper, paperwork, etc in zip-top bags to protect from moisture. Consider your climate when packing clothes. We pack layers so we don't have to rotate clothes according to season. Store enough cash (in a zip-top bag to protect it) in case you don't have access to an ATM or bank. Remember to pack things to keep the family entertained. Playing cards, books, and notepads/pens all store compactly and provide a variety of ways to entertain both kids and adults. Wet and dry things separately bagged, then stored in one large zip-top bag for easy location in the family bag. Every year we use our tax refund to build our emergency supply storage (not just the 72-hour kits, but food/household goods storage, and our emergency saving's account). This year, we hope to buy a generator and a second water barrel. Wow! I'm impressed and convinced that I will be in trouble in an emergency. 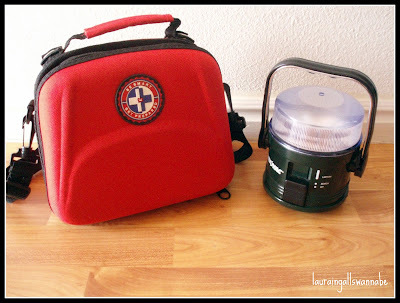 I should make my own emergency bags, especially for power outages. This is SUCH an important reminder and a great post. I'll be referring it to it as I get our kits ready this fall.